Café from the Service des Objets de Dessert, dated 1819-20, was drawn by Jean-Charles Develly as part of a table service for the Royal Sèvres Porcelain Manufactory. The factory was founded in Vincennes in 1740 and later relocated to Sèvres in 1756. In 1800, Alexandre Brongniart (1770–1847) was chosen as the administrator of the factory and along with him followed many changes. Perhaps most important was the switch from so-called soft-paste porcelain, which is considered artificial, to hard- or “true paste” porcelain. This change was critical to Sèvres’ popularity since hard-paste has a higher resistance to water, making it ideal for coffee and tea services, whereas soft-paste is more likely to crack when encountering hot liquids. Brongniart also favored the notion of creating unifying themes for each table service and tasked Jean-Charles Develly with designing most of them. Develly’s design for Café belongs to a group of 36 plates produced by Sèvres as part of a table service entitled Service des Objets de Dessert, which highlights the production of foods served for dessert in France. 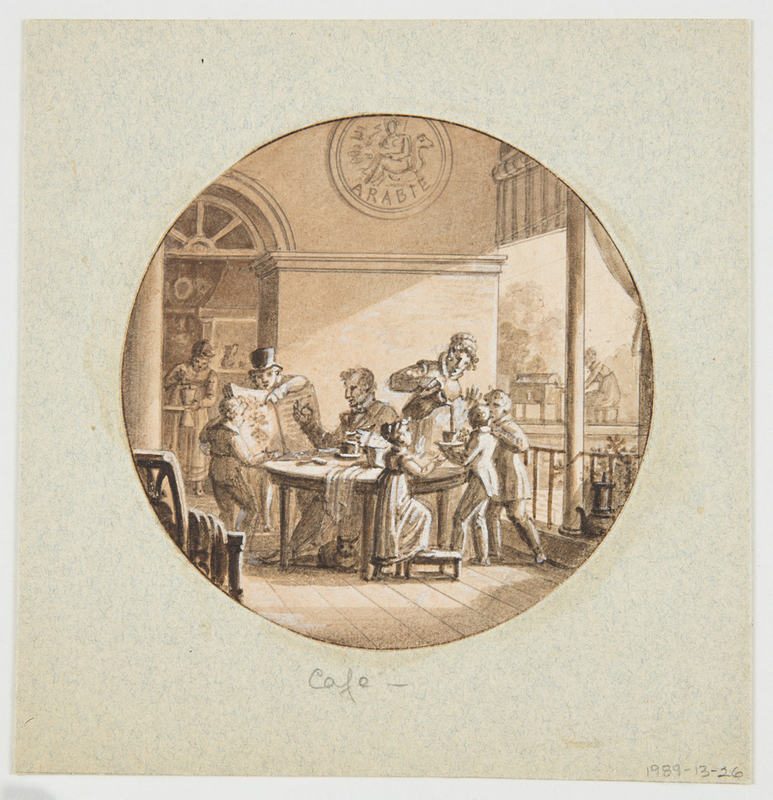 The drawing depicts a very busy scene in which nine figures engage with coffee in several different ways. Located in the center of this small, circular design is a group of men, women, and children surrounding a table. A woman appears to be pouring a cup of coffee for a young boy while two children stand on opposite sides of him making sure he does not spill anything. To their right, a seated man with a bow tie appears to be admiring the coffee bean he holds in his right hand, while to his right a man is teaching a young boy about coffee plants by showing him a drawing in a botanical book. Framing this group are two women, one located in the rear right using a bean-roasting machine and the other in the rear left grinding coffee. In his design practice, Develly preferred to draw scenes from real life, and each project required many studies as the final product had to be drawn on a minute scale in order to be transferred onto the center of a plate. Develly transferred the drawing onto the plain porcelain by rubbing the back of the drawing with a uniform layer of graphite. Placing the drawing at the center of the plate with the graphite layer facing the porcelain, he would trace the outline onto the plate with a pointed tool. Finally, he would paint the outline in two stages, a rough sketch and then a retouch, with a firing in between each stage. This drawing is included in the exhibition The Virtue in Vice, on view at Cooper Hewitt, Smithsonian Design Museum through March 25, 2018. Nikky Gonzales is a Curatorial Intern in the Department of Drawings, Prints & Graphic Design at Cooper Hewitt, Smithsonian Design Museum. 1 The Editors of Encyclopædia Britannica. “Porcelain.” Encyclopædia Britannica. July 07, 2016. Accessed November 06, 2017. https://www.britannica.com/art/porcelain. 2 Newman, Louise. “An Exceptional Sèvres Dessert Service.” The Magazine Antiques, April 1994, 553.